MetaMoJi, the multi-award winning producer of mobile productivity applications, is pleased to announce that beginning today, their specialist education application “Share for Classroom” will be available for schools around the world to beta test. 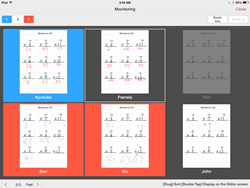 Share for Classroom allows teachers to customize visually engaging lesson plans and collaborate with their students in real-time interaction as they work through the lesson on their tablet computers. Students can work individually or collaborate in groups as defined by their teacher. Share for Classroom provides all of the award-winning features of the MetaMoJi Productivity Environment, including note taking with multiple styles of pen and papers, tools to work with images and web content, voice recording, handwriting recognition and the ability to edit any content at any time. This allows students to quickly correct their work, change colours of existing writing or drawings, reposition and scale anything on a page and to add effects such as shadows and borders. MetaMoJi Share for Classroom builds upon the existing MetaMoJi Cloud infrastructure, allowing the optional cloud storage of documents, shared repositories for teams to place documents, and for multiple students to work on documents at the same time from any location. This visual collaboration can be controlled by a teacher on a page-by-page basis, allowing creativity and imagination to be applied in the correct places within lessons. MetaMoJi applications are compatible with displays via HDMI or broadcast technologies (such as Air Play) allowing teachers to display their content from their tablet on a larger TV or projector screen. This can be used to provide a large interactive ‘digital whiteboard’ that can be opened to students as required. All students’ tablets can also be forced to reflect the teachers chosen content and to display any annotations that they make. Recent awards for MetaMoJi products include winning the business / government app category at the International Business Awards, winning two Envisioneering awards at CES 2014 for our Share technology.